The destination was Melaka, Malaysia. But the temptation is irresistable. And so we went to Legoland! Marian and Maricel accompanied me to Melaka when we decided to drop by in Legoland. We started our journey from the border of Singapore particularly in Woodlands where we boarded the bus en route to Johor Bahru. We had to board the bus for only 2SGD and then alight at the boarder for immigration purposes and board anew the same bus going to JB, Malaysia. It took us less than 45 minutes to reach JB Sentral. From JB Sentral, we chartered a taxi to Legoland for 200 Ringgit. It took us 45 minutes before reaching our destination. And after 45 minutes, we were there! We stayed for almost an hour and roamed around. But we did not enter Legoland! Instead of going inside, I bought souvenir items and shop a bit! 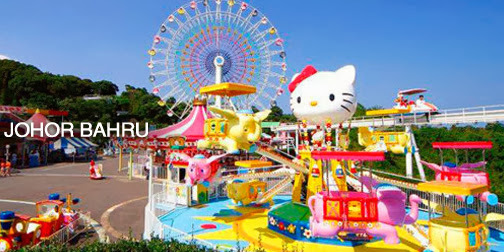 While you are in Johor, you can also visit Helly Kitty Malaysia. It is very near to Legoland. Legoland and Hello Kitty are both in Johor Bahru, Malaysia. From Legoland, I went straight to Melaka.